Assembly of a tool could not have been simpler. The only real assembly consisted of attaching 4 anchor eye bolts to the tool’s cabinet. I chose to mount it to the ceiling in order to control fine dust within the shop. This is definately a two person job since the assembled cabinet weighs about 70 pounds. The unit has three fan speeds and can be set for either continuous operation or set via a timer for 1 to 4 hours. The cleaner will remove 99 percent of 5 micron particles with the outer filter and 85 percent of 1 micron particles with the inner filter. The size of the outer filter is 12×24x1 which is a commonly available size and is easily replaceable. The inner filter is cleaned with either compressed air or washed out. The unit comes with a battery powered remote for activating the cleaner. From my experience with the unit it operates well and does a good job of removing the really fine dust that poses a heath risk when inhaled. This is one of shop’s necessity that enables a woodworker to work happier and healthier. Very nice machine Scott…wishI had one. I see those little particles floating in the sunlight. That was also my experience when I got my Jet Model AFS1000B Air Filtration System. Just the four I bolts and an extra body to help do the “hanging”. You will be pleased with this piece of equipment. After a night sanding you can just leave the unit on and leave the shop and know that it will shut down later. Congrats on the new unit. A very important addition to a woodworking workshop and thanks for sharing it. What is the cost of the unit? Ofcourse a good dust mask should also be used. I’d also be a little concerned about all that exposed fiberglass insulation blowing around, thats not exactly good for you either. just wondering how you decided on PM vs other brands. this seems like an item where the PM price premium might not be worth it, but you seem to think this stuff out thoroughly before buying . Just curious. Good point, Woodchuck. I have considered putting up a ceiling of some type in there but simply have not gotten around to it. One of the problems that I have is that there is only 92” of clearance to the bottom of the joists. The joists had to be notched 1/2 inch to provide clearance for the garage door opener. But it definately is one my list. Scott, even some thick mil plastic would be an improvement, or better yet if your not strapped for cash, ceiling tiles between the joists. i also just purchased the jet afs , wood craft has it on sale right now for $259, i couldn’t beat the price ,and as a turner i sand alot. I have always had excellent service from both the company and the equipment. And on-line reviews for this cleaner have all been positive. So part of the reason for buying is simply due to customer loyalty- the same reason I have always bought F150s. But another reason for buying the Powermatic was due to outer filter being a standard size that is readily available from Wal-Mart, Lowes, etc. I read reviews about the Jet, for instance, which uses an odd size filter that either requires modification of a standard filter (usually with duct tape) or buying it from Jet, which adds significantly to the cost. 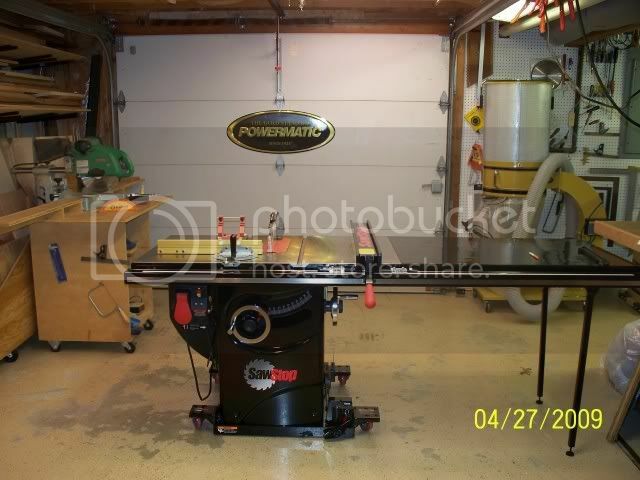 Not a big issue in the long run but just another reason, at least in my mind, to buy the Powermatic. That is a perfectly fair answer in my opinion. Actually nice to see when cost isn’t the only factor. I’ll reward quality or excellent service with loyalty as well. Its not always an easy choice, but in my short time on this planet, I think it has paid off far more often than not. Did you just come into some cash form an inheritance or did you rob the local bank?LOL…... Sawstop and PM aircleaner at the same time. What else have you recently purchased? Great addition to your shop for safety week! That’ll help keep the old lungs clean. Good tool but it’s best if you don’t let the dust in the air to start with.